We have acquired one of the top most positions in the industry for manufacturing and supplying a wide range of Antibiotic Tablets. These tablets are easy to swallow and do not cause any side effect. Our clients can avail these tablets in different dosage as per their requirement and demands. We test these tablets before supplying to ensure their reliability. 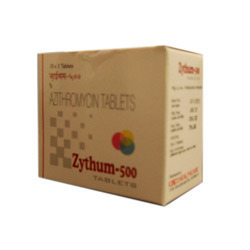 We are offering a wide range of Azithromycin Tablets to our clients. These products are tested for quality to make them compatible as per the international standards. These medicines are hygienically packed so as to provide safe and longer shelf life. Our products are widely appreciated for high quality standards. Looking for Antibiotic Tablets ?